Throughout the troubling events of the last two weeks, I have clung to the belief that Mali’s political crisis will be short-lived. Then last night I got some news that underscored the gravity of the present situation: Peace Corps is pulling its volunteers out of Mali. Consider that in 41 years of working in this country, Peace Corps has never evacuated before. Through the killer droughts and famines of the 1970s and 1980s, through the popular revolution and coup d’etat that toppled a longstanding dictator in the early 1990s, Peace Corps Volunteers have been here, quietly serving the Malian communities in which they lived. Over the years the Mali program has often received Volunteers evacuated from other regional trouble spots such as the Central African Republic and Guinea. It has never before had to order its own staff to pack up and go. As long as the nearly 200 PCVs remained in Mali’s towns and villages, I could entertain the notion that things hadn’t gotten that bad. Yesterday I ran into a group of young Volunteers getting ready to head home. They were sad to go, and they were worried for Mali and for the friends they’re leaving behind. Meanwhile France has temporarily closed its high school in Bamako and has recommended (though has stopped short of ordering) its 5000 citizens in Mali to leave. Now the U.S. State Department has initiated “authorized departure” of its personnel and their dependents from Mali, and the Peace Corps program is suspending its work here. 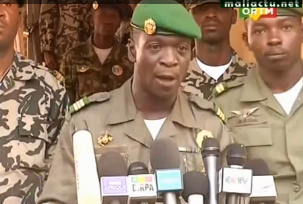 As I contend they’ve been doing all along, Mali’s coup leaders continue to improvise. They have adopted an approach that appears to be conciliatory toward the international community — promising a return to constitutional rule and a swift handover to an elected civilian government — but that stubbornly adheres to their own obscure agenda and timetable. For all its overtures and calls for dialogue, the ruling CNRDRE junta does not appear willing to make concessions in response to outside pressure. Now the junta is offering a “national convention” with Mali’s entire “political class” to discuss the country’s future. In a move that signals it may be more concerned with looking back than looking forward, it has also proposed putting the deposed president Amadou Toumani Touré on trial for high treason. This is significant because it effectively forestalls any attempt to return the country to its pre-coup legal framework, which would restore Touré (however symbolically or temporarily) to power. The only encouraging sign in the CNRDRE’s behavior is that so far it has refrained from demonizing the governments and regional bodies opposing it, leaving more critical responses to some of its most radical supporters. But talk of military intervention by Mali’s neighbors grows louder by the day. The sanctions, which appear to have taken the junta by surprise, are beginning to bite. Already throughout Bamako there are long lines at banks for cash and at service stations for fuel. Some Western diplomats here predict that the junta will not be able to withstand the embargo for even three weeks. How much worse will things get? Do I want to stay to find out? This entry was posted in Uncategorized and tagged bamako, coup, mali, Peace Corps. Bookmark the permalink. Terrible news. I’m so sad. Hi Bruce, thank you for sharing your thoughts. I especially liked your first analyses so I subscribed to your weblog. Contrary to you, however, I am puzzled by the rapid and vehement international reactions concerning the coup in Mali. – Apparenty, there is little international indignation about cutting Mali in two by the Mnla (although the participation of important salafists and other islamists is starting to worry more than one). – International reactions concerning deadly violence by Ouattara’s supporters in Ivory Coast has remained very meek. – The coup by Mohamed Ould Abdel Aziz in Mauretania in 2008 passed without much reaction (see Ahmed Ould Cheikh’s commentary on http://www.lecalame.info/contenu_news.php?id=3498). So why is it that this improvised and nearly bloodless coup in Mali against a head of state who was openly despised by the French government is sparking off such vehement reactions from France, Ecowas, the African Union and, to a lesser degree, the United Nations? Finally, I guess that many Peace Corps Volunteers work in rural areas that might come under the threat of islamists’ violence against westerners. That’s altogether different from the violence of the 1990’s against the government that was far worse than that associated with the current coup but not directed against westerners. Many observers (and ordinary Malians) feel the hard line taken by the “international community” (read ECOWAS, African Union, United Nations, France etc.) has been driven by President Ouattara in Cote d’Ivoire, who knows what it means for an illegitimate regime to cling to power over several months. He seems to have two reasons for taking this hard line against the CNRDRE. One, he was really offended by what happened on 27 March when protesters kept the ECOWAS delegation from landing at the Bamako airport. Two, and probably more substantially, he wants to apply certain lessons learned from what happened in his country last year. The theory is that if you put strong measures in place from the beginning, instead of imposing them in stages over several weeks as was done in Cote d’Ivoire, the crisis will be resolved quickly instead of dragging out over several months. That’s the theory–we’ll see what happens in reality! Hi Bruce, thanks again for this opportunity to share and confront thoughts. Let me propose you another theory about French reaction. The coup, even if it chased ATT from power, wasn’t really against ATT (who would have gone anyway). The coup was in fact against the French-supported successor of ATT, the one who was nearly sure to win in the next presidential elections. Even if the coup wasn’t intended like this, it boiled down to it and especially so in the eyes of France. So France’s vehement reaction was inspired by the fact that it’s hopeful presidential candidate was outmanoeuvered by the coup. France and its closest allies (especially Ouattara) reacted very aggressively. This could seem strange, because France was already very critical of ATT. It was also in strong contrast to it’s attitude in reaction to the secennionist moves by the MNLA. (By the way, I often wonder why France is so much in favour of nomads in Africa, and treats the nomads in their own country so badly). After playing the sorcerer’s apprentice with the MNLA, France was shocked that not their befriended African nomads, the Tuaregs, appeared to remain in charge, but the ominous salafists of Ansar Dine and other islamists. But it was too late to back off, so France continues to play its cards against the coup leaders without admitting that the threat from the North of Mali is perhaps far more dangerous, not only for Mali but also for France and for other countries. I hope France and its allies can still return from this fatal position and support the coup leaders against the islamists who want to monopolize power in the north of Mali. In the present conditions, it seems that the coup leaders in Mali need international support against this perspective. Mnla might become a partner in negociations if they show some sense of reality. There seems to be little to be expected from the other factions involved in the struggle in the North of Mali. One last remark: the attitude and the actions of France in Mali remind me strangely of the attitude and actions of the USA in Latin America (France will be proud to be – still – compared with a -albeit declining – superpower). Both continue to try to exercise their influence in what they consider as their continent. For the moment, France seems to be more succesfull in this sense; as the USA have been largely thrown out of Venezuela, Bolivia and Equador and – to a lesser extent – other countries. But in making the wrong choices, France may be thrown out of Africa as the USA has been largely thrown out of Latin America. I assume the candidate you refer to is Modibo Sidibe… there are definitely rumors that he was ATT’s designated successor. But I’m generally skeptical of any theory that sees France lurking behind each significant development in this country. I think if the French wanted to hatch a coup here, (A) they would have organized it much better and (B) they wouldn’t have put an untested, American-trained English instructor at the head of it. But that’s just my own skeptical nature talking. I totally respect and support your decision, whether you stay or go. I also want to thank you tremendously for these updates. I have relied on them heavily for the past few weeks. Ala ka here la. Ala ka bee deme. My heart breaks for Mali. I’m still hoping things will get better soon and not too much worse. Thank you so much for the updates and know that you and your family and friends are in our thoughts all the time. Bruce, I’m so glad you stick around and tell us what’s up! We (a number of Dutch ‘Malians’) are so very concerned about what is going on. Keep up the good work & your strength! Bruce, you and your family are in our thoughts. I too kept thinking that as long as fresh faced PCVs were sticking around that everything was manageable. I can only imagine the difficult decision you and your family are now having to consider. Good luck. Thank you for what you write. It’s something clear in the midst of such confusion. Even my heart is breaking for Mali: my son was born in Bamako, and I am waitinig for my second son/daugther from Mali. I hope that everything is going to adjust. But k’an kelen kelen wuli..
PC came quite close to evacuating in 1991 due to the demonstrations that occurred prior to that coup. Separately, a few volunteers were pulled out of the north due to the Tuareg situation then. I’m so sad, but not surprised, given your posts, to hear that they are evacuating. Please be safe. You, your family and all Malikow are in my thoughts. Bruce – how are people holding up in Bamako? I spoke with a friend the other day and he said that the markets are significantly depleted and they have no gasoline for the moto. Any word from people in Sikasso? I haven’t spoken to anyone in Sikasso yet. I haven’t been in touch with anyone outside of Bamako yet. Things still seem rather “normal”–I went around town today by taxi and SOTRAMA, fuel is still available, but everyone knows it’s running out and prices of many staples are poised to go way up. Hello. My husband spoke to his family in Sikasso yesterday. They report that for the moment everything is fine. I think the fear is not knowing what is to come. I was so happy to find your blog a short time ago, just on the heals of the coup. I was a PCV in Mali from ’91-’93 living in Baroueli and Konobougou in the Segou region. It is a part of my life that I miss much more than I ever thought I would. Your blog have given me a connection that I have enjoyed. I plan to make time soon and start from the beginning and read all of your words. This will weigh on me for a long time. I will keep everyone affected in my prayers. I thank you for the information you have continued to share. Hello Michelle. I was in Baroueli as a PCV from 1996-1998. Absolutely loved my Peace Corps time there. Now I’m married to a man from Sikasso and have a beautiful child, here in the States. I am so worried about my family in Bamako, my friends in Baroueli and Konobougou and my family in Sikasso. I did speak to my djatigui (Gaoussou Kone – did you know him?) a few days ago. In his words, “On a fait un coup. Tout est calme.” I will call him again soon. Ni ala soona. Bruce, I remain very grateful for all the time, energy, and deep thought you have put into your writing on this blog, particularly since 3/22. I am deeply saddened by the unfolding situation in Mali. I can only imagine how difficult a position you, Oumou, and your kids are now in. I don’t know if there is anything Cindy and I can do on our end to help out, but if there is please don’t hesitate to let us know. You, your family, friends, neighbors, and Malians as whole are at the forefront of my thoughts and heartfelt prayers. Allah k’i deme. K’aw kisi ko jugu beh ma. Ka here bil’aw nye. thinking of you and yours bruce. be safe and let us know if we can help in any way. we are back in oregon now. peace be upon mali. I remember reading your stories for your hometown paper way back when (they were reprinted in the Mali Rag or something?). I appreciate your thoughtful reporting now more than ever and was wondering–hoping–you might have news on the situation in the north, especially the Mopti Region. Thanks for sharing your experiences in Bamako. I am so worried about the fate of all of our beloved second home. Ala bring peace. Thanks again for the news Bruce. Your blog has been consistently THE best source of information in English about Mali, and I’ve recommended it to many friends and co-workers. This is a distressing turn of events. Stay safe! Our thoughts are with you and your family, and with all of our friends in Mali. I’m currently living in Niger’s bush a year-and-three months after the U.S. Peace Corps left Niger. France STRONGLY advises against anyone living or even traveling outside of Niamey right now. Boko Harem was discovered selling arms a few hours from us in Niger. My colleague was recently physically attacked and had his motorcycle stolen 1 km from our home (the culprit was caught and is already in jail). However, we’re free to go into Maradi (a 30-minute trip) at any point in time and buy food and fuel and whatever else we need, without undue concern of our safety BTW, my Nigerien wife and I have 3 girls under the age of 8 years. Having said all of this, if I was in your situation, I would be planning to leave. I just see more and more chaos developing in the weeks and months to come in Mali. In Niger, I feel that I could go to the local authorities and gendarmes and they would take our concerns seriously, as I see them proactively enforcing the law and maintaining civil security. If I ever lost that confidence, I would leave here with my family. Bruce, just want to echo the sentiments above. Our daughter Devon (Golaszewski) working with MHOP left on Sunday and now with the news of PCV pulling out I’m glad she did. I’m grateful to your posts for it’s good reportage and analysis and the “person on the street” perspective. One can only hope, given that one can’t really predict anything, that there is still a chance things will evolve to a positive end. I find tears lingering in my heart as I think of my time in Mali and the country itself. I was/am a mother of a PCV in the 90’s and fell in love with the women in the village while I was there.. The willingness to so easily return my caring. I have a namesake there I’ll never know and friends passed on and still working…. they taught me so much. I think of them and all that a coup can mean and I feel pain in my spirit and much more for you all that gave so much of yourselves for years and I am so proud of all of you that served dreams and needs. merci de vos témoignages. Je suis contente d’avoir trouvé ce blog. I hope there won’t be much time to let them get worse. This has to end as soon as possible. But how??? I would like to add a personal message to everyone writing in such a sympathetic way, many friends of Mali (and many of you ex-pupils of Lamine Bagayoko, I guess). I am in Bamako, too, and I feel there is no direct reason to leave this special place. But we all worry about bad things that might come, and for sure physical conditions will get worse (nothing to compare with what is happening in the north, however, at least that’s what I think). People in the north of Mali are suffering and we all hope that some solution will be found to end that suffering as soon as possible. Bruce – just found your blog – wow! So sad about evac for PCVs. Do what’s best for you and your family. Thank you for these posts…. I cannot express how much they mean to me. I just stumbled upon your blog today, and it was sad to read this post. I’ve been recently invited to serve in the Peace Corps, leaving for The Gambia in June 2012. I hope things get better quickly and that the country recovers so that Peace Corps can return.